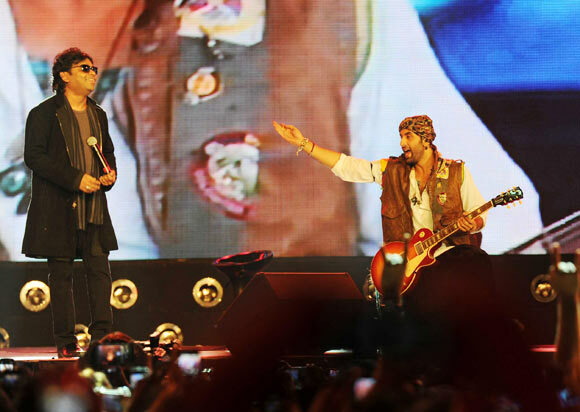 Everything at the 'Live In concert' to promote Ranbir Kapoor's forthcoming movie Rockstar was commonplace. The 10,000-strong crowd gathered in the grounds of Bhawan's College in Andheri, a north Mumbai suburb, did all that they were supposed to do. They dressed like they would for any other concert and behaved as they were expected to, swooning as if in a trance, or giving cat calls, whistling, and blowing their lungs out at the sight of the dramatis personae. 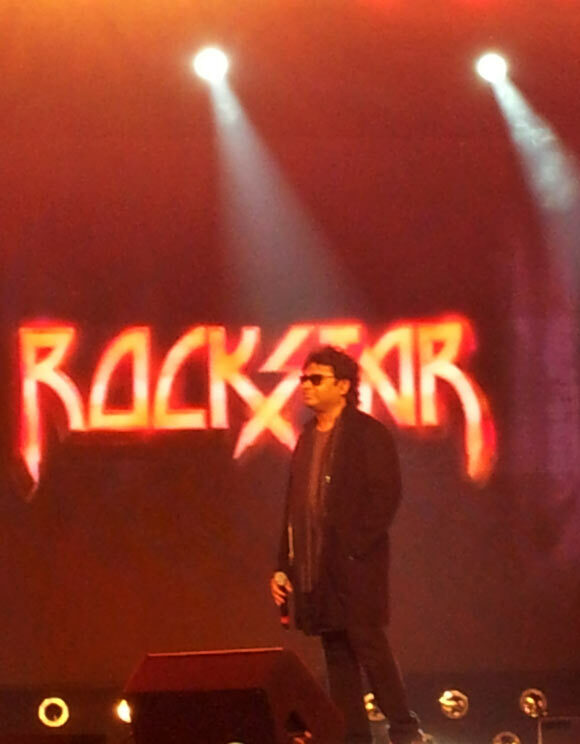 The stars of the evening -- and there were many, like actor Ranbir Kapoor, music director A R Rahman, Ranbir's co-star in Rockstar, Nargis Fakhri, music composer Ranjit Barot, singer Mohit Chauhan, percussionist Sivamani -- did their bit too. How are you doing, Mumbai?" yelled Ranbir Kapoor soon after he emerged from under the dais in a well-rehearsed move. The tormented soul Janardhan Jakhar that Ranbir plays in the movie tells the crowd that he is looking out for some feathered friends that flew away after their abode in the jungle was usurped by the city. "Main un parindon ko dhoond raha hoon. Aap ne kahin dekha hai unhe? (I am looking out for those uprooted birds. Do you know where I can find them? )," Ranbir asked the audience, reflecting Janardhan's angst. That was an invitation for the crowd to get animated. "You are so cute, Ranbir!" shouts Veena, a teeny bopper seeking the attention of her "super star". 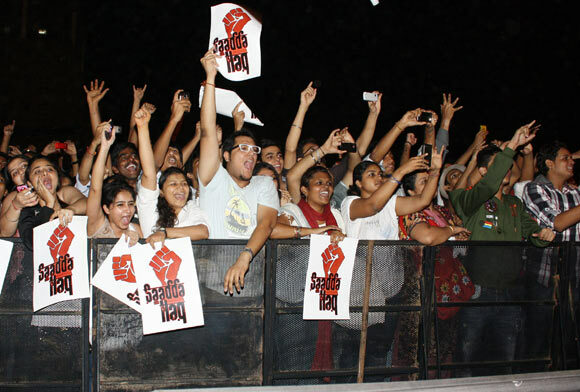 A collegian, she had shelled out Rs 1,000 for an entry pass that would get her closer to the stage. She knows that her voice is drowned out by the cacophonous crowd and the loud music belting out of powerful speakers, but that doesn't deter her from trying hard for the next two hours without showing any signs of physical or vocal exhaustion. Archana, another teenager, fresh out of college and working for Red Chillies Entertainment, was lucky to get free passes to the concert. But she and her four office friends are not Ranbir fans. 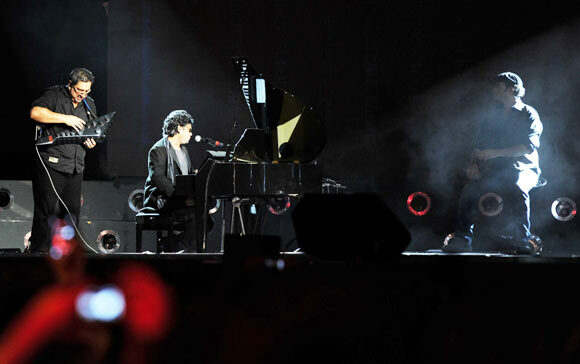 I have come here for A R Rahman," she says when asked if she finds Ranbir hot. "I love his music." She doesn't seem to be particularly animated during Ranbir's performance, but springs to life when Rahman makes his entry on the stage. At just about 4 ft 5 inches, she cranes her neck to catch a glimpse of her icon from behind some 50-odd heads that block her view, moving to her left and right, and trying to push her way ahead. I'm used to such gymnastics," she says, gamely trying to hide her disappointment at not being able to get a clear look at the composer. The best she can manage is a glimpse of him on a giant screen, but she croons along happily with Rahman when he sings Nadaan parinde aa ja tu (Come back to your roots, oh my feathered friend who had gone astray). "This is my favourite number," says Amod, a student from Mumbai's Mithibhai College. 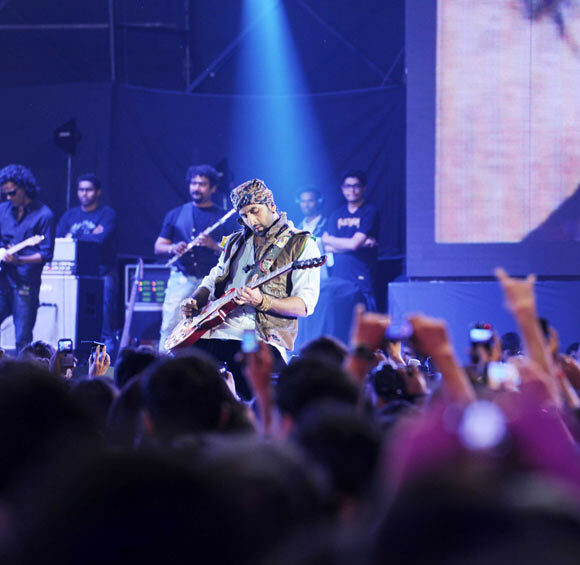 "Though not up the charts yet, this song will soon replace Sada Haq," Amod predicts. So what's so special about the unrated number? "This song is about homecoming and best expresses what most of us are going through," he explains. "Rahman's music is haunting." Ranbir fans may have outnumbered Rahman's, but most people we spoke to said they were there for the music as much as for Ranbir. 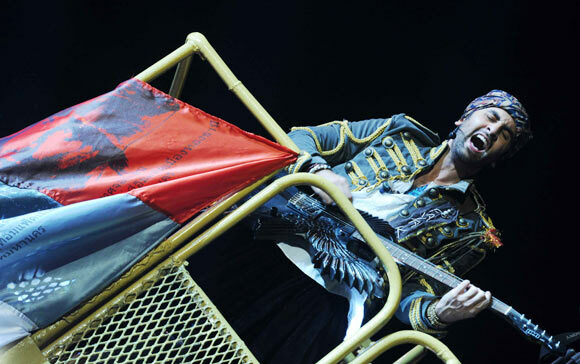 Would you watch Rockstar to see Ranbir? "Not just him," says Adil who is accompanied by his middle-aged parents. "Rockstar is also about super music." And are his parents Ranbir or Rahman fans? "Neither. They just love good music." He tries to get them to leave before the concert ends so as to avoid the crowds and also because "I have to report to office tomorrow at 5 am." A pragmatic fan, this. Most others we see seem to be more involved with the music, swaying trancelike to the music and lip-synching with Rahman, Ranbir, Nargis, and Mohit as they moved up and down the stage. Not everyone was lucky enough, or rich enough, to get in. Before the concert started -- a full hour behind schedule, incidentally -- Mohammed Zeeshan, originally from Allahabad and studying in Mumbai, pleaded with the organisers for passes. 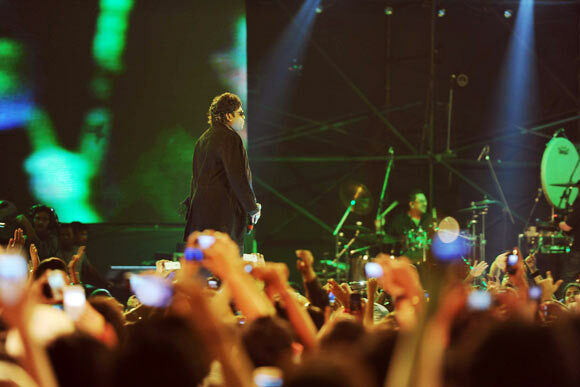 The maximum he could spend to watch Ranbir, Rahman and company perform "live" on stage was a meagre Rs 200. Dhruvin Shah, another collegian, had forked out Rs 1,800 to fulfil his dream though the passes were priced between Rs 100 to Rs 1,000. "I was busy studying so could not make arrangements earlier. Now that the entry passes are sold out, my friend got me this pass for Rs 1,800," he says with the smile of a winner who made it despite all the odds. 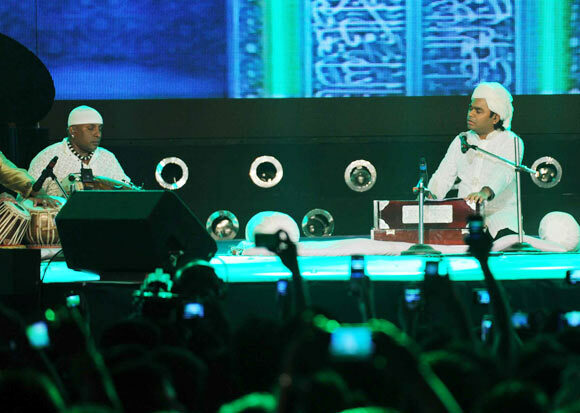 Seven-year-old Irfan, a kid from a slum near the venue of the concert, is flashing two ten rupee notes with a flourish. "Could you help me get in?" he asks everybody who bothers to lend him an ear. What does he think is happening in there? "I don't know much but I have come here to see 'the show'," he answers. Irfan doesn't understand rejection, unlike Janardhan Jakhar, who becomes a rockstar following rejection in love. But maybe, one day, Irfan may triumph over the unfair hand fate and a callous government have dealt him, and will be part of a concert, grooving, tapping and singing Sada Haq (I will get what is rightfully mine).